They were married during a fairy tale wedding in Byron Bay last week. And Sam Wood, 38, took to Instagram on Monday to share some touching, candid photos of his new bride Snezana taken on their big day. One photo shows the stunning 38-year-old bride walking along with her veil covering her face, taken before the ceremony. Snezana certainly looks ethereal in the photo, her intricate lace wedding dress clinging to her slim curves. Holding a bouquet of white roses with her lace veil floating around her, the brunette appeared serene. 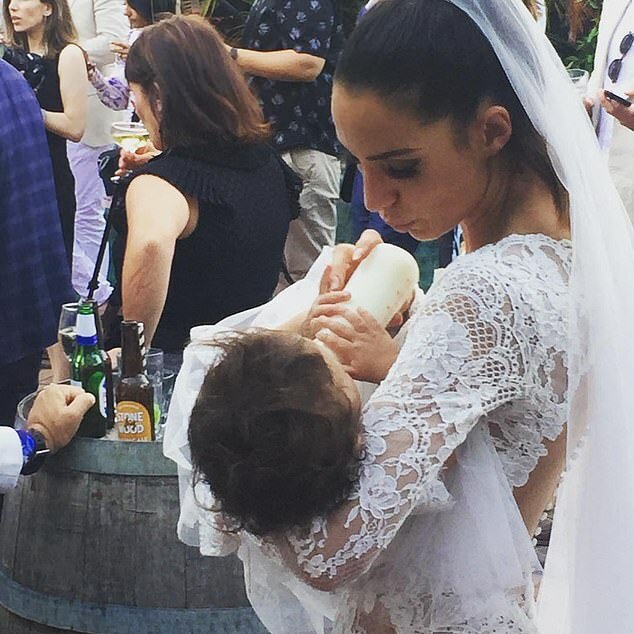 Another photo shared by Sam on the same day shows Snezana cradling the couple’s daughter, Willow, one, at the reception. Sam explained in the caption: ‘Putting little Willow down before we danced the night away’. 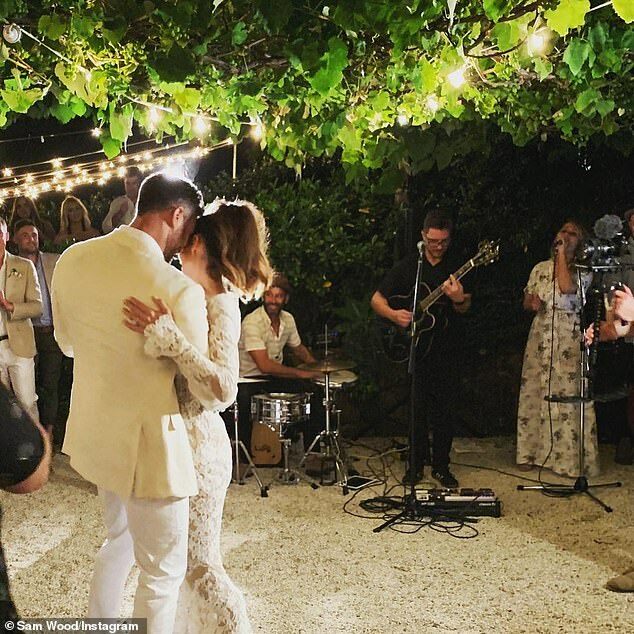 Yet another photograph shows the newlyweds slow-dancing in a garden setting a band playing in the background, as they shared lovelorn gazes. 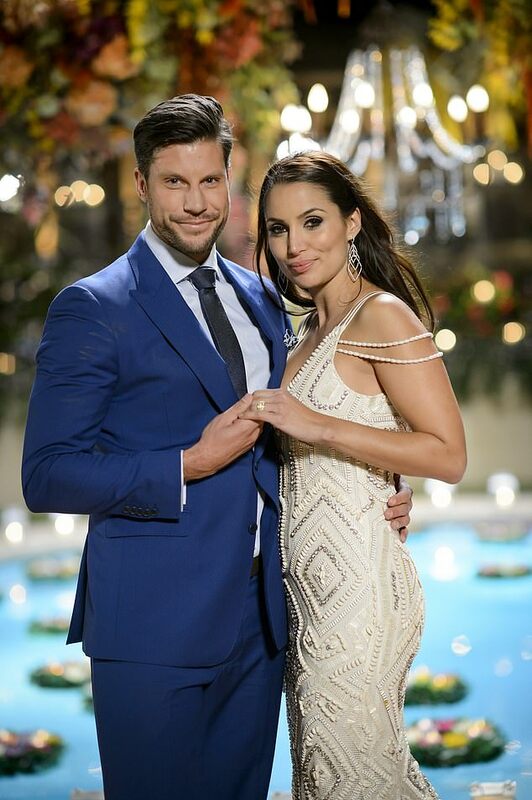 Sam and Snezana, who fell in love on the third season of The Bachelor, exchanged vows at the Fig Tree Restaurant in Byron Bay, on the NSW coast, on Thursday. The bride looked simply breathtaking in a backless lace gown from Paddington-based boutique Pallas Couture. She arrived at the ceremony in a Kombi van, adding a bohemian touch to the otherwise glamorous wedding. Their young daughter Willow came close to stealing the spotlight away from her famous parents during the proceedings by acting as a flower girl. Snezana’s bridesmaids, including her teenage daughter Eve, wore blue-grey dresses with thigh splits for the occasion. Around 70 people attended the nuptials, which took place at around 3pm on Thursday afternoon and after the ceremony, guests were seated in an 80-person reception area for dinner.